Not everyone has access to prime private ground. Here’s how to triple your odds of tagging public land bucks. A 90-minute walk coupled with months of scouting and the patience to wait for the right wind earned public land bowhunter Nick Whitney a chance at a brute of a public land whitetail. When Nick Whitney, who is currently active duty with the Air Force military police, was transferred to eastern Nebraska a few years ago, he began to research local public hunting spots. Since Nick is an ardent bowhunter, a state area near his new base that permits only archery and muzzleloaders was a good place to start. Nick hunted that locale awhile and encountered a few small bucks and some other people. Then he was deployed to Afghanistan and couldn’t hunt for a year. Upon returning home, he was determined to make 2017 his year. “I decided to go for it and hike as deep on the 3,000-acre public area as I could,” said Nick. He started scouting in late summer, making the 90-minute walk back to where he would hunt on a thick river-bottom. He looked for rubs, tracks and trails. He hung a few cameras and stands. A good wind came on November 13, and Nick hiked to his stand early. It wasn’t long before he spotted a doe, then three more. Awhile later a twig snapped on the same trail. “I saw deer legs, a big body, and then a flash of antlers,” Nick recalled. The buck walked behind a tree, and Nick came to full draw. When the deer reappeared, Thwack! His shot was money. After 7 years of bowhunting, going when he could between work detail and deployments to serve our country, Nick Whitney finally killed his first mature whitetail. Public land draw hunts, such as the one Scott O’konek applied for, limit the number of hunters accessing a given tract. Reduced hunting pressure equals more daytime buck encounters. The first thing Nick did right was to find a primitive-weapons-only tract managed by the state. There may or may not be one of those near your home, but it’s worth a check of your state’s fish and game website to find out. Anytime you can hunt where rifles or slug guns are restricted, you have a leg up. There will be far fewer hunters on the land. With no booming guns — possibly with the exception of a few muzzleloaders — the bucks will be less spooky and nocturnal. Another good but overlooked option is to apply for a “lottery hunt” that takes place on a military base or state forest near your home. Pull a limited-entry tag and you’ll win the right to bowhunt prime, lightly pressured whitetail habitat. Any one of these hunts will produce above-average chances to fill the freezer with a doe or small buck. Of course, earning a chance at a dream buck, like Scott O’konek did in 2009, is not at all out of the question. Hours into a 2-day draw hunt on Camp Ripley in central Minnesota, Scott ran his climber up a tree. When the sun came up, he spotted a buck that buckled his knees. Scott kept his composure and made a perfect shot. The 32-pointer with ginormous brow tines net scored 227 3⁄8. You might not kill a buck like Scott’s, but hey, stranger things have happened. Go online and see if a similar hunt with limited public access — and lots of possibilities — is available in your area. To avoid hunting pressure, figure out the easy access points and hunt far away from them. Nick Whitney took on the mindset of: I’ll work harder than the other hunters, and that was a major reason he killed that big Nebraska 10-pointer last fall. Do the same and your chances of tagging out will soar this season, whether you hunt a small state area or a 100,000-acre national forest. Studies have shown that 90 percent of people rarely, if ever, hunt more than a mile from their truck. Get in shape, study maps, put a climber on your back and walk 2 miles or even deeper into an area. Want to see nobody else and hunt when deer are moving best in daylight? Take off work and hunt Tuesday through midday Friday. A couple years ago, researchers at Auburn University tracked GPS-collared deer on a moderately hunted public area. Once hunters began arriving on Friday, daytime deer movement dropped rapidly. Bucks hardly moved at all as people tromped around the woods on Saturday and Sunday. Deer continued to lay low on Monday. By Wednesday, the woods had settled down and the deer felt comfortable moving again. In short, go deep during midweek. No crops? No problem. Find white oak acorns on public ground and deer are sure to visit. If there is one golden rule of whitetail hunting anywhere, it is this: Find the food sources, because that is where you’ll find 90 percent of the deer. Trouble is, food is a limiting factor on most public areas and often gets a lot of attention from other bowhunters. As you’re researching, especially if you live in the Midwest or West, look for public areas that have agricultural fields and/or food plots. It might be a state walk-in area, “block” management or a similar public/private tract where some corn, beans, alfalfa or clover are planted. There will be deer on a state management area like this. The drawback is the tract will typically be small, which concentrates hunters and pressure. But if you can find an area with some row crops and then find a secluded corner of it to hunt, you have a good chance of killing a buck. 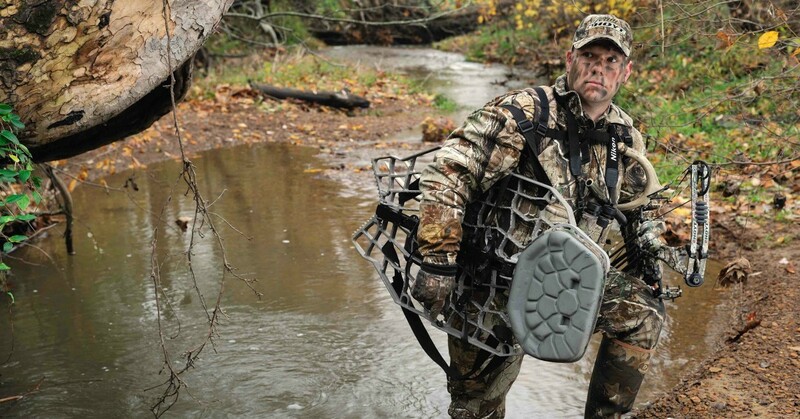 Most of the time, however, going deep means hiking into backcountry devoid of fields and food plots. Back there, look for natural browse and mast; the top food sources of public land whitetails. Set your treestand on a green thicket along a creek, on the edge of a clear-cut or old burn, or downwind of an oak grove where nuts are pattering down. Hunt hard and have fun. Your biggest worry might be to get a big buck out of there.